Mortgage insurance increases again - Phoenix, AZ - N.A. 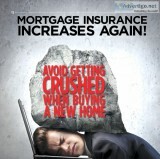 Mortgage insurance increases again!Avoid getting crushed when buying a new home. SNMC offers alternative loan options. . Making buying a home as affordable as ever. For a Free pre-approval, call or email today!Cell --DylanJamesM TGsnmcFor more info visit: SecurtyNational Mortgage CompanyArizona Mortgage Banking # Images and contact details on Advertigo website.